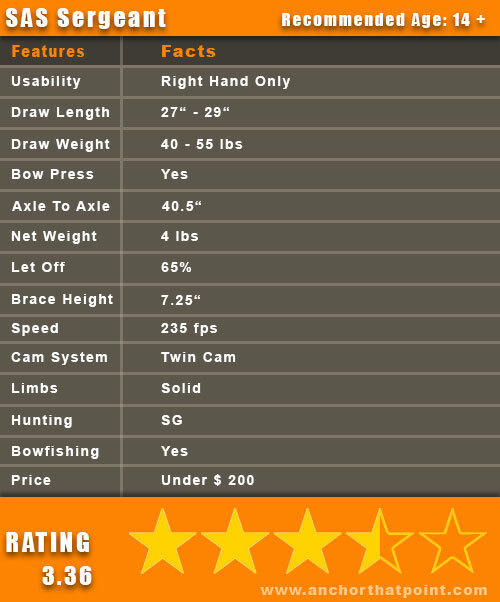 Hello and welcome to this Best Compound Bow For Youth Comparison! Shooting compound bows is trendy! Especially kids want to be like Katniss Everdeen, Hawkeye or Merida after watching those movies and guess what – they need a bow for being like their heroes. The problem is that there are a lot of models available, for different age groups (kids, tweens, teens), different price ranges and different purposes (fun, recreational, competition, bowhunting). That’s why I made this rather short comparison about the best compound models available for youth archers at the moment. I hope this helps you to find an appropriate youth model that will get your kids outside, away from the TV, videogames and smartphones that demand so much attention from them all the time. I prefer to have them outside for hours and by gifting them a bow, you may achieve just that. In order to give you clear comparisons for the following youth compounds, I took 7 important criteria that may affect your decision and assessed each compound based on those factors. Every criterion can get a maximum number of 5 points. The final ratings are calculated by adding all points up and dividing them by 7 (which is the total number of criteria). Be aware that most of these models only have slight differences concerning my ratings, as I have only included the most interesting ones! I hope this comparison will help you with your decision on which youth compound to buy for your kids. I know this can be hard, because there is so much available all the time, but when you learn a bit about the more interesting models, you will be able to choose one that fits your child best. This is all about where the bare youth bow is manufactured, which materials were used, if it is well made and sturdy. Most compounds are made from modern composite materials and aluminum nowadays and thus, are quite durable. You have to take a real close look at the included accessories, as those are – more often than not – rather cheaply made, which means that you have to invest into better add-ons like arrow rests, bowsights, peep sights or stabilizers etc. just to get the best results when shooting the particular compound. 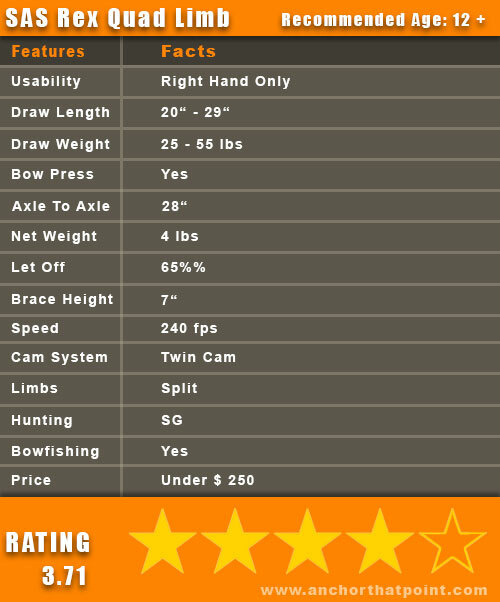 This investment can be as much as you paid for the bare bow and sometimes even more. That’s why I deducted points from the ‘price’ criterion sometimes. This is important especially for youth archers, as it determines for how many years a little archer could use the particular compound. Some are outgrown pretty fast, some last for a few years and some are so widely adjustable that they would last for decades (if you buy them when your kid is still very young!). This criterion refers mainly to if the compound exists in an ambidextrous version – which means that it could be shot by righties and by lefties – or if there are versions for right and left-handed shooters available or not. If you have to switch the string and the cams with a bow press I deducted a point from the ambidextrous models. This one is important for parents that don’t want to mess around with finding the right accessories and arrows etc. Most models for very young children are ready to shoot, which means you can pick them up and start shooting. Models for older kids – think teens – are usually a bit more complicated, but at that age they usually know what they want and need concerning accessories and arrows. 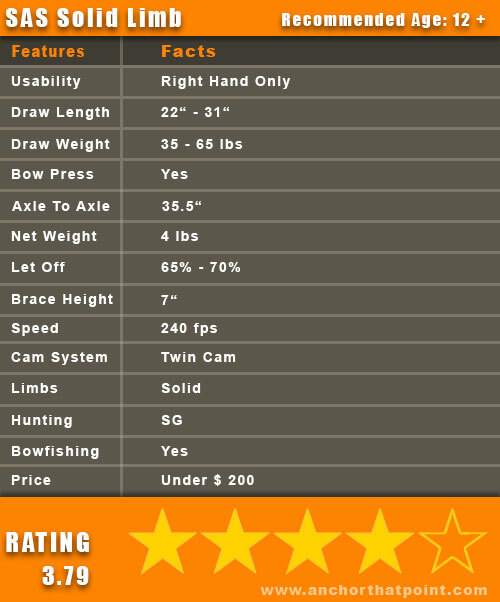 This criterion is about smooth and easy draw cycles, solid back walls and the overall accuracy the bow is capable of. This often depends on the optimal accesories, that’s why I assumed that those are added for my ratings – specifically in those cases where the add-ons that come with the particular compound are more or less junk. I know that a lot of parents choose a youth compound for their kids because of its price – who doesn’t, right? Just remember that the models for teens or young adults will usually cost more than for the little ones. When I deducted points because the price was very affordable (not talking about cheap here), that means that you have to invest into better add-ons additionally. You will also find a fact sheet for every youth compound tested where I collected data like axle to axle (ATA) length, net weight, brace height, let-off etc., so that you have a good overview about all those features in one place and can make your decision more easily. I hope you found this short explanation of my ratings useful and I really hope that the following comparisons will help you to find a good compound for your children. I split the models into four age groups: 3 – 5, 5 – 10, 10 – 13 and 14 and up. These are average numbers. Of course you have to look at the individual kid; some kids are stronger and might be able to draw more weight than others, so don’t take those age groups as set in stone. 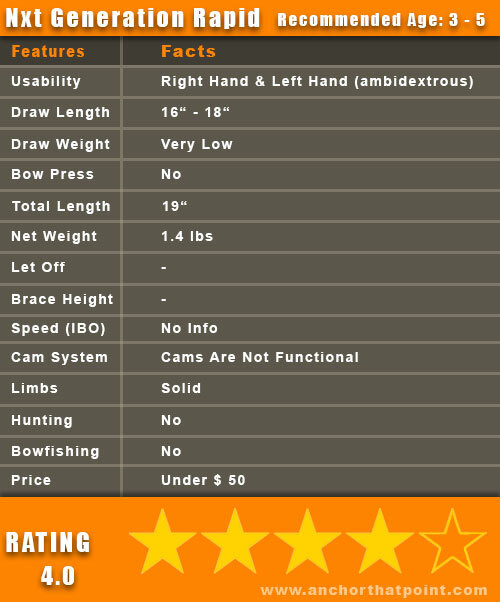 Please be aware that we rated a few models a bit differently than in our Best Compound Bow For Under $ 500 Comparison, as youth archers have different needs than adults. That’s the reason why ratings for the same models may differ. One last tip: It is a good idea to measure your kid’s draw length – especially when he or she is already a bit older or taller than the average kids in his or her age group. If your kid’s draw length is longer than the maximum draw length setting of the youth compound, he or she needs a different youth model! 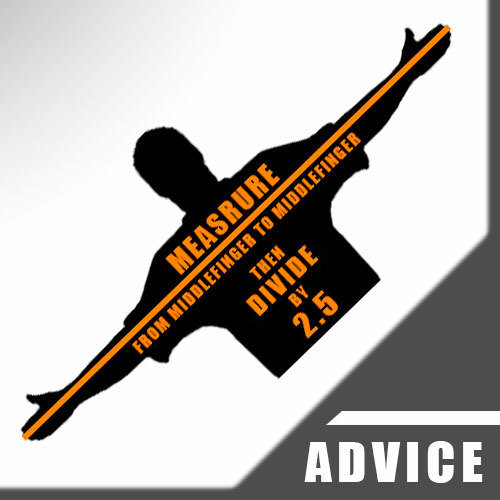 Here’s a guide how to measure this => How To Determine Your Draw Length. 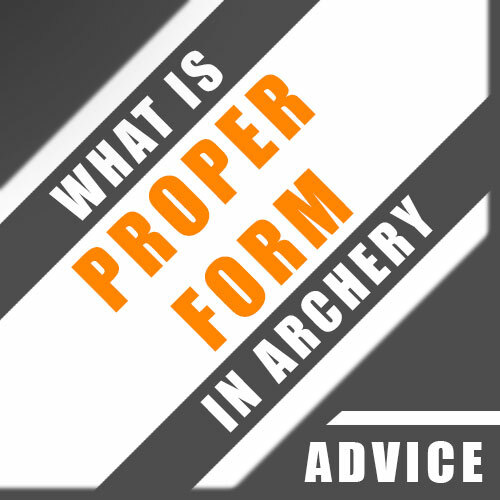 And here is a beginner’s guide if you want to learn a bit more about compound bows in general => Beginner’s Guide To Compound Bows. Here I will review models that are meant to be shot by very young children that are 3 to 5 years old. Bows for this audience are primarily meant to introduce them to archery, to learn to handle a youth compound bow in a safe and responsible way and for target practicing. So don’t expect too much of these models, dear parents. Having fun and getting your kids outside, away from the TV and videogames should be the primary focus when gifting them such a bow. You often need to buy more and better arrows, so I usually recommend getting Easton Genesis 2 (1820) youth arrows, as those are proven and work for models that have a draw length between 26 and 28 inches. In this category ‘Ready To Shoot Out Of The Box’ means that your kids can start shooting right away. The Genesis Mini is made in the USA by Brennan Industries. It is the smaller brother of the Genesis Original, which is the official model of the National Archery In The Schools Program. 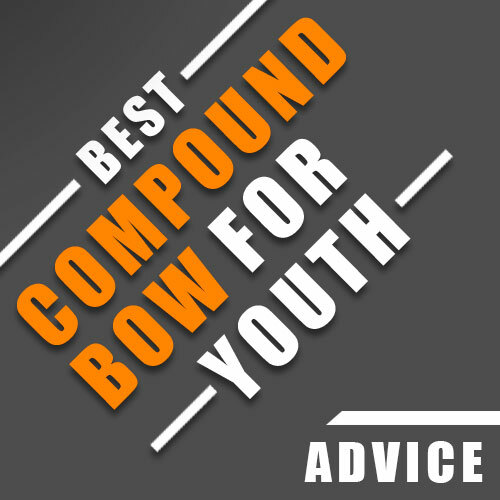 It is made only of the best high quality materials and components out there – a true contestant for this best compound bow for youth comparison. The arrow rest is not bolted onto the riser, that’s why it falls off from time to time. As kids at that young age are often times struggling with keeping the arrow on the shelf while drawing, it is a good idea to get a Whisker Biscuit or a similar brush-style rest, as they make it a lot easier for the little ones to keep the arrows in place. The poundage can be set from 6 to 12 lbs by adjusting the bolts that connect the limbs to the riser. One full turn decreases or increases the weight by approximately 1.4 pounds. You shouldn’t make more than 7 full turns, I suggest you stay with 6. The draw length range is 14″ – 25″, and is not adjustable. The Genesis Mini is available in a version for right and left-handed shooters. Definitely yes. You only need to install a nocking point – it comes with temporary nocking points – or a D-loop, if you want your kid to shoot with a release aid. But at that young age that would be overkill, I think. You also need to get some arrows. The Easton Genesis 1820 are recommended for the Genesis Mini. The Genesis Mini is very easy to use, as it should be finger-shot. It is very smooth and easy to draw and shoots pretty accurately. Your kid could – provided he or she has got some skills – achieve 3″ groups up to 10 to 15 yards. At around 150 bucks you will get a high quality youth compound, that could be used by your kid until it is 8 years old. On the other hand, 150 dollars might be a bit much to test if your 3 year old is interested in archery at all, because I don’t know a single 3 year old that could tell for sure what he or she will be interested in within a few weeks. Read the full review here => Genesis Mini. This one is made out of a modern composite material. It is durable and sturdy, but be aware that the pulleys are not functional. They are only there for the looks, which makes the Nxt Generation Rapid Riser rather a toy than a youth compound bow. On the other hand, this one is the safest option you could get, because no one ever was shot by a suction cup arrow, right? That’s why I have included this youth model into this category – even if it is not a real youth compound. The add-ons are decent. A window target, a suction cup and two velcro tip arrows (but there is no velcro target included). I suggest you get more suction cup arrows as soon as possible, as children are not that easy on their equipment. The draw length is around 16″ – 18″ (not adjustable), the poundage is very low, which makes sense, as this youth compound is meant to be shot by very young archers. As the adjustability is very limited, your kid will outgrow this one very soon, but it is the safest option to start out nonetheless. The Nxt Generation Rapid Riser is ambidextrous, which means that it can be shot by right and left-handed archers, which is a good thing, because the kids can share it without having to adjust anything. Yes. Just pick it up, attach the target to a window and start to shoot. The Nxt Generation Rapid Riser is very easy to use thanks to its shoot-through riser. Young children often have the problem that they are not able to keep the arrow on the shelf while pulling back the string. Here, the arrow is kept in place by two small pieces of rubber inside the hole in the riser, that’s why it cannot fall to the ground all the time. The wide nocks make it easy for the kids to nock the arrows to the string, another plus. The Nxt Generation Rapid Riser weighs only 1.4 pounds and is good for target practice up to 10 yards. At around 30 bucks you will get a good option for testing if your kids might be interested in archery at all without breaking the bank completely. They will outgrow it pretty fast, though. On the other hand, every minute they prefer to spend outside, away from the TV and videogames is a good one, in my opinion, so those 30 bucks are well spent. Read the full review here => Nxt Generation Rapid Riser. In this best compound bow for youth archers category I will test models that are meant to be shot by kids that are between 5 and 10 years old. The models presented here are good for testing the waters and introducing your kids to archery after watching The Hunger Games (Katnis Everdeen), The Avengers (Hawkeye), Merida or Arrow and to ignite the spark that has been left by those movies. Some of these bows are pretty affordable, so you don’t have to spend an arm and a leg to test if shooting bows might be an option for your kid. This one is a high quality youth compound. It looks and feels like a full sized adult bow. Apart from that, all available accessories for hunting bows can be attached as well, as there are pre-drilled holes for everything. It has a carefully machined black aluminum riser and highly durable solid composite limbs. Overall it looks and feels quite sturdy. The add-ons that come with this one are great for starting out. The three carbon arrows are better than those that come with most of the other models out there. The only thing you might want to upgrade to a Whisker Biscuit (maybe from Tropgy Ridge) rather sooner than later is the arrow rest. And get more arrows! The poundage range is from 6 to 29 lbs and can be adjusted by loosening or tightening the bolts that connect the limbs to the riser. Just make sure you have the same amount of full turns on each bolt. The draw length range is from 12″ – 24″ which covers a lot. It is adjustable in 0.5 inch increments without the need of a bow press. This wide adjustability lets the Diamond Atomic shine in this best compound bow for youth beginners comparison. 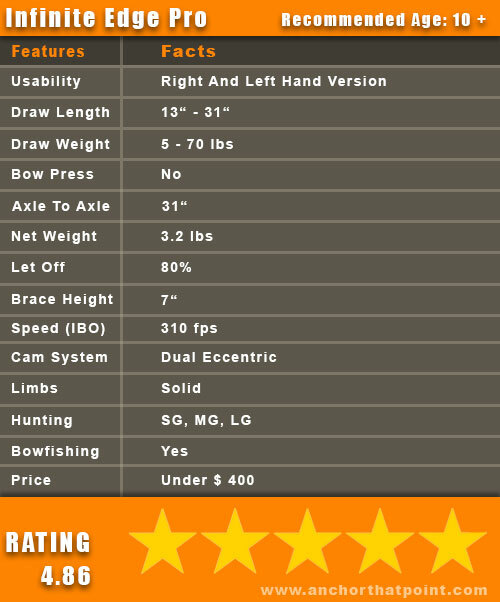 The Diamond Atomic Youth is available in a version for right and left-handed archers. Definitely yes. The only things you have to get installed are a peep sight and a D-loop. As these need to be adjusted to the individual shooter, this won’t affect my rating negatively. The Diamond Atomic Youth is absolutely easy and smooth to draw. It is very accurate up to 20 yards and more (after serving a peep in and getting a D-loop installed) and it seems to be well balanced overall. Apart from all this comfort it also has an Infinity Setting, which zeroes the let-off so that everyone can shoot it (it acts like a recurve when activated), which makes it a good option for archery camps or groups as well. All this quality has its price, though. You have to pay around 180 dollars for this youth compound and to be honest, this might be a bit much just to test if your offspring is interested in shooting compounds or not. The bow is worth every dollar, though. It is a very good choice for a kid that will stay in archery for years and looks forward to the season every year for joining his dad bowhunting, not for someone who saw Hawkeye the other day in The Avengers and decided he wants to shoot bows now. Read the full review here => Diamond Atomic. 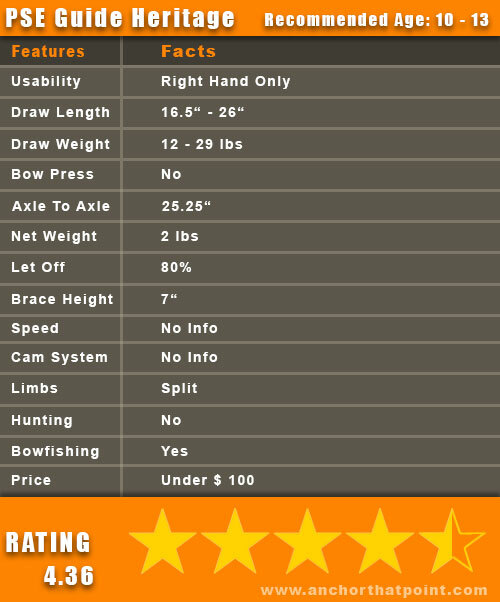 This Best Compound Bow For Youth Archers contestant is well made and feels quite sturdy. It is constructed to Archery Trade Association (ATA) and Archery Manufacturers’ Organization (AMO) standards, which stand for quite some quality. The add-ons are okay for starting out, but the arrow rest is flimsy. I would suggest you get a Whisker Biscuit or any other brush-style rest instead, as those will make it a lot easier for your kids. The 2 fiberglass arrows are junk. Just buy a bunch of Easton Genesis 2 (1820) and enjoy happy faces. The draw weight range of the Barnett Tomcat is from 17 – 22 lbs. It is adjustable by loosening or tightening the bolts that connect the limbs to the riser. The draw length range is from 20″ – 22″, adjustable in one inch increments. The manufacturer recommends a bow press for adjusting, though, which is kind of a downer. The Barnett Tomcat is only available in a version for right handed archers. Definitely yes. Your kid literally can pick it up for shooting right away. The Barnett Tomcat draws pretty smoothly. It is accurate up to 20 yards and can be finger-shot. Therefore it has finger rollers attached to the string that can be used as a nocking point too. The whole draw cycle is rather soft, which is good for beginners as well. At around 40 dollars your offspring will get a high quality entry-level youth compound that is manufactured by one of the big brands in the world of archery. These 40 bucks won’t cost you an arm and a leg for testing if your kiddo might be interested in shooting compound bows. So yeah, go for it! Read the full review here => Barnett Tomcat. As Bear Archery stands for quality, the Scout is no exception. It is made from a modern composite material (riser and limbs) and looks like it can take some beating from the kiddos, which makes it a real Best Compound Bow For Youth contestant. The add-ons are more or less okay for starting out. The arrow rest is a bit flimsy, because it is taped to the riser. And you need to get more and better arrows (Easton Genesis 2 (1820). 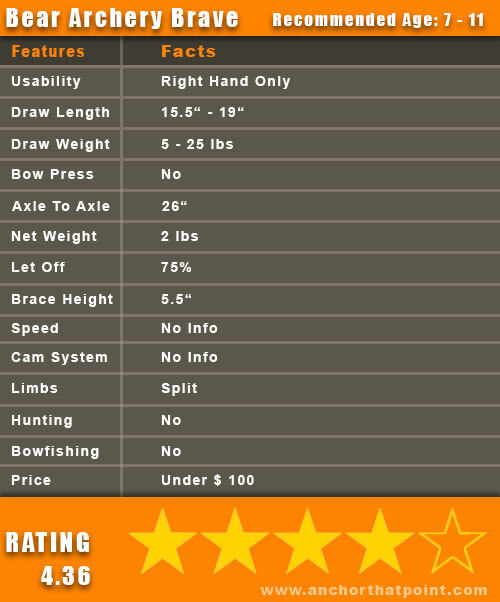 The draw weight range of the Bear Archery Scout is from 8 to 13 lbs, and is not adjustable. Its draw length range covers 16″ to 24″, which means it is not adjustable either. This limits the Scout a lot and it will be outgrown rather sooner than later, depending on how young your kids are when you gift it to them. 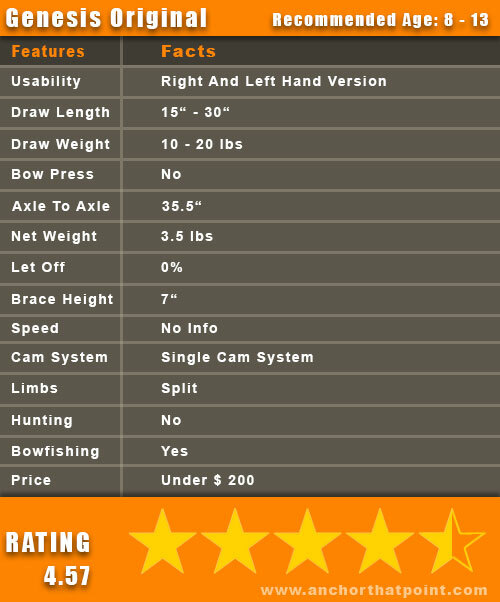 The Bear Archery Scout is ambidextrous, so right handed and left handed archers can use it without adjusting anything. This is always a plus, as archers at that young age might want to share it a lot with their friends or their siblings. Indeed. Just pick it up and start shooting. 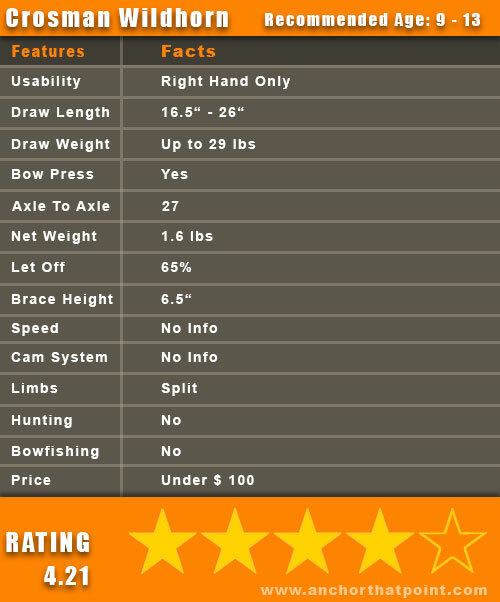 The Bear Archery Scout is easy to draw and is fairly accurate up to 10 yards. The whole draw cycle is pretty smooth without any humps, which makes it easy for the little ones to have fun with it. This youth compound costs around 30 bucks – which is a well invested sum for testing if your kid might be interested in shooting compound bows or not, as we all know how fast such an interest can fade. Apart from that, it is well spent if there is the chance that your kiddos will be outside for hours and hours. 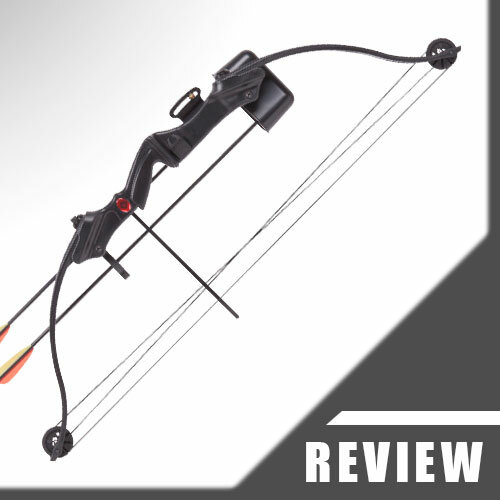 Read the full review here => Bear Archery Scout. The Brave is manufactured by Bear Archery, which is one of the bigger players in the world of compound bows. It is solidly built, looks sturdy and durable, due to the modern composite material that was used for making it. The add-ons are quite good except the 2 Safetyglass arrows that are made from fiberglass. Those will break soon. I suggest you get a bunch of Easton Genesis 2 (1820) youth arrows. The poundage range of the Bear Brave is from 15 to 25 lbs. You can adjust it by tightening or loosening the bolts that connect the limbs to the riser (limb bolts). Clockwise increases the poundage, counter-clockwise decreases it. The draw length covers a range from 15.5″ to 19″, and is non adjustable. This means that if the draw length of your kid is between 15.5″ to 19″, you are good to go. 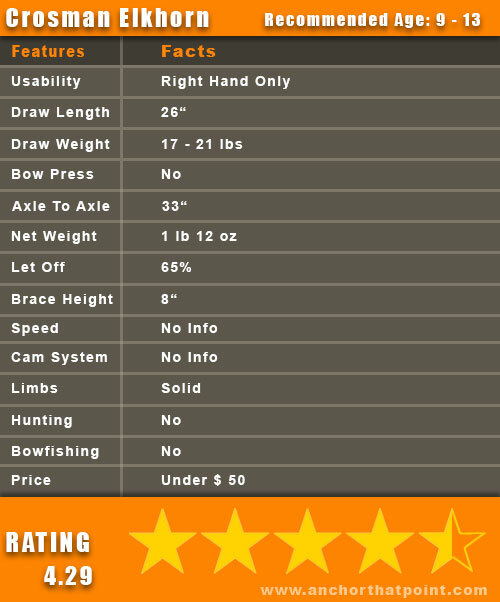 The Bear Brave is only available in a version for right-handed archers. Yes. Everything for starting out immediately is there. The Bear Brave should be finger-shot, that’s why there are finger rollers installed onto the string. All the full sized adult models should be shot with a release aid, by the way, but for kids it is often easier this way, as it is simpler. Their focus should be on having fun and learning how to handle a bow like this in a responsible and safe way. It draws pretty smooth and shoots very accurately for a youth compound. For 60 dollars you will get a nicely manufactured youth compound that has quite some quality to offer. It is also a good option for testing if your kid’s interest in archery will last long enough to gift him or her a more expensive compound after they have outgrown the Bear Brave. You cannot do much wrong here for 60 bucks. 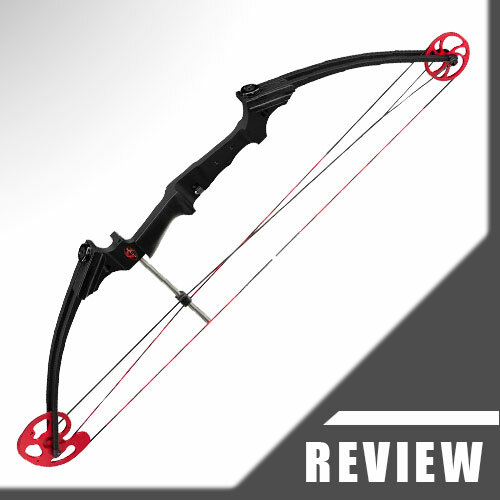 Read the full review here => Bear Archery Brave. This one seems to be well made. It feels sturdy and durable and looks like it could take some beating from kids. It has a composite riser and fiberglass limbs. Crosman is very well known in the world of archery, that’s why I have included this one in this Best Compound Bow For Youth comparison. The add-ons are okay for starting out and there’s no need to get better ones. But you need to buy better arrows, as the two that come with the bow are crap. I would suggest the Easton Genesis 2 (1820) youth model or shorter ones. The poundage is set to 10 lbs. It is not adjustable. The draw length covers a range from 22″ to 24″, and is not adjustable either, which means that the Crosman Upland will be outgrown sooner or later, depending on how early you get it for your offspring. This model is ambidextrous, so righties and lefties can shoot it without any problems. This is great if your kid shares it with his brother or friend a lot. Yes. You only have to install a nocking point or no-gloves (finger rollers) to the string. Otherwise your kid will get frustrated pretty fast. The Crosman Upland draws pretty smoothly. It shoots relatively stable and accurate and is overall well balanced. For around 30 bucks you will get a decent starter bow for testing the waters and for getting your kids outside for some hours. The sooner you gift them this youth compound, the longer they can use it. If your children are already 7 or 8, I would get them a model for older kids. Read the full review here => Crosman Upland. The models in this category are meant to be shot by tweens. They have higher draw weights and longer draw lengths, but they are still there to introduce the sligthly older kids to archery. They can also be step up models for children that have already started shooting at an early age. The Genesis Original is made in the USA by Brennan Industries. It is only made from high quality materials and looks and feels like a full sized adult bow. It has split limbs made from durable composite, an aluminum machined riser, as well as aluminum machined cam and idler wheel. 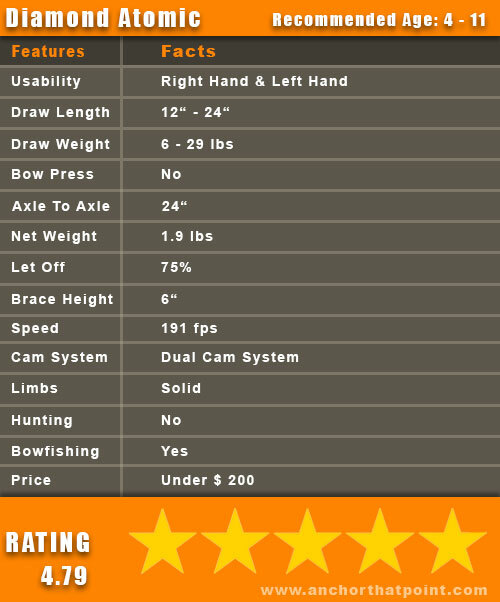 It is a quite remarkable contestant for this Best Compound Bow For Youth comparison, in my opinion. It is the official youth compound chosen for the National Archery In The Schools Program and is used by thousands of pupils over the country due to its reliability and its ease of use. This one comes without anything, it is just the bare bow. You can attach a Whisker Biscuit but be aware that adding goodies might not meet the requirements for competitions within the NASP! The arrow rest that comes with it works quite well. I gave 4 points because this one is meant to be shot like it is – with no additional bells and whistles. The draw weight ranges from 10 – 20 lbs and is easily adjustable via the limb bolts that connect the limbs to the riser. Tightening those will increase the poundage, loosening will decrease it. Just make sure that you have the same amount of full turns on each side. The draw length range is from 15″ to 30″. It is non adjustable as the line of Genesis bows is known for having zero let-off, which means that they are shot more like recurve bows where you have to hold the peak weight all the time while aiming. There are versions for right-handed and left-handed archers available. Yes. You need additional arrows, though. I recommend you get a bunch of Easton Genesis 2 (1820) aluminum arrows, as these are the official youth arrows for competitions within the NASP. The Genesis Original draws very smoothly and is well balanced. The single cam system works like a charm and sends arrows down the range pretty accurately. 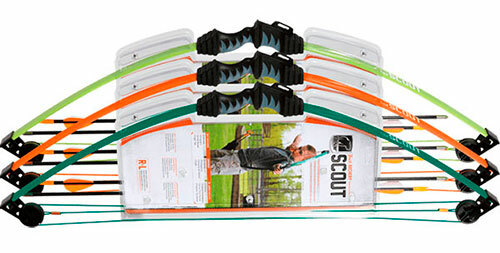 As this model has zero let-off it can be used by a lot of kids because you don’t have to mess around with draw length settings all the time while shooting, which makes it an excellent option for camps and archery groups. With a price point around 150 dollars this one is a bit more expensive than all those models around 30-60 bucks, but quality has its price. Apart from that the Genesis Original is a competition quality bow and is definitely not comparable to a youth compound that costs 30 dollars. Read the full review here => Genesis Original. The Barnett Vortex Lite is constructed to Archery Trade Association (ATA) and Archery Manufacturers’ Organization (AMO) standards. This means it is a well made and high quality youth compound that is able to take a lot of beating from the kids. It is made from composite, feels very sturdy and has durable limbs and cams. The arrow rest that comes with this one is crap, as are the 3 fiberglass arrows. This means you need to get a better rest (Whisker Biscuit or other brush-style rest) and better arrows. Try the Easton genesis 2 (1820), as those are proven youth arrows. The poundage ranges from 18 to 29 lbs and can be adjusted with an Allen wrench. Just loosen or tighten the bolts that connect the limbs to the riser to adjust it up or down. The draw length can be set from 22″ to 25″ in one inch increments without the need of a bow press. The Barnett Vortex Lite is only available in a version for righties at the moment. Yes, all you have to install is a nocking point / no-gloves or a D-loop. The Barnett Vortex Lite draws smoothly and is able to achieve tennis ball sized groups up to 15 yards – provided you get a better arrow rest and better arrows. The generous let-off of 60% – 70% is great for beginners and will make aiming a breeze. For around 75 dollars you can test if your offspring might be interested in archery as much as you are, without breaking the bank completely. This youth compound is worth every penny, by the way and Barnett is known for having a very good customer service, so you cannot do much wrong here, in my opinion. Read the full review here => Barnett Vortex Lite. PSE stands for Precise Shooting Equipment and has been in business for decades. This youth compound is made of high quality components and the composite material feels like that of the full sized bows they offer, so you don’t have to make any compromises when choosing this one. The add-ons are quite okay for starting out, however the two fiberglass arrows that come with the bow are crap. Again, I would suggest you stay with Easton Genesis 2 (1820) instead. 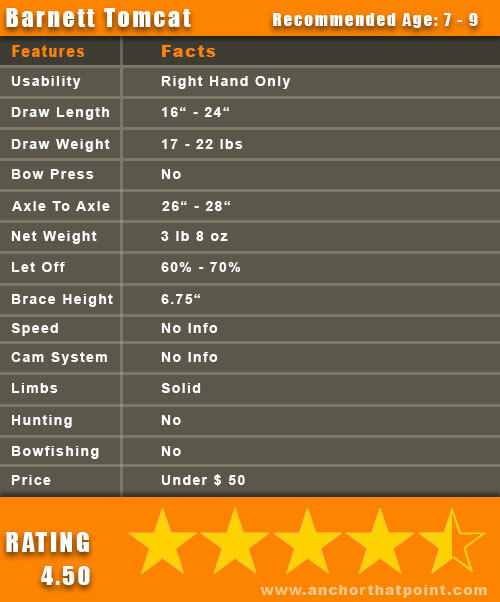 The poundage range is from 12 to 29 lbs, the draw length range is from 16.6″ – 26″ – both are adjusted at the same time without the need of a bow press. The problem is, when you want to set it to a certain poundage, that is not achievable without changing the draw length as well! 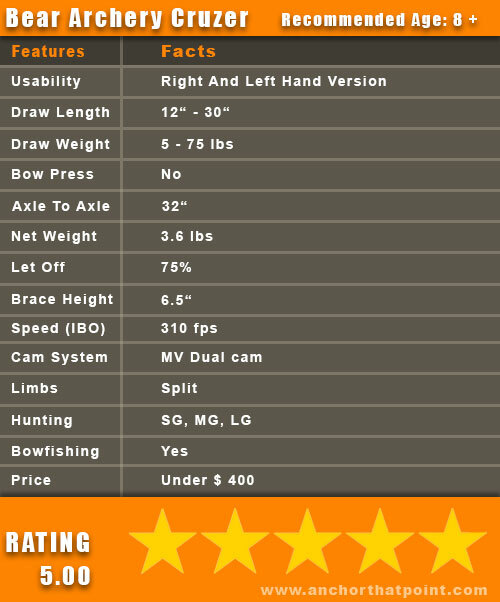 The PSE Guide Heritage is only available for archers that shoot with their right hand at the moment (holding the bow with the left hand, pulling the string with the right hand). Indeed. Just get better arrows, as the two provided will be destroyed fast. 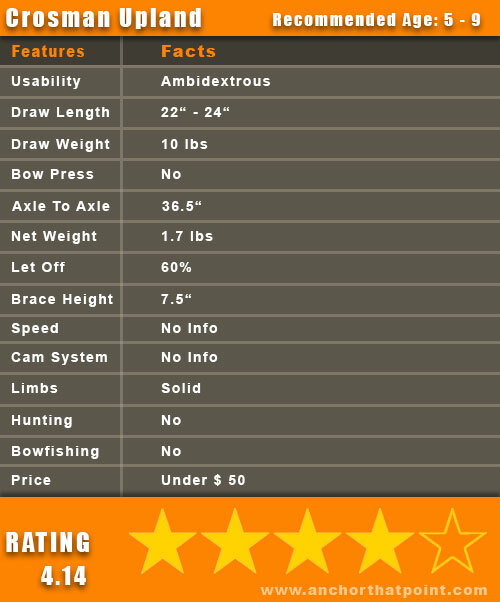 The PSE Guide Heritage is smooth and easy to draw. The back wall is solid, the valley wide enough. The let off of 80% is still good for beginners. Provided your kid has got some skills, it is accurate up to 10 yards without a problem. The finger rollers – the PSE should be finger-shot – act as nocking point and make shooting consistently pretty easy. 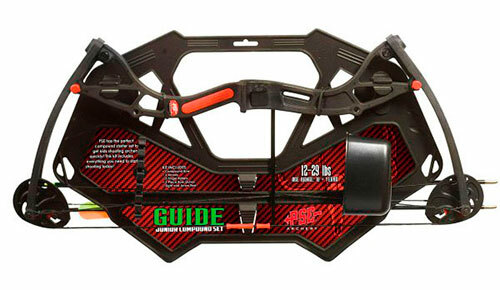 The PSE Guide Heritage costs about 70 dollars, which is still a good deal compared to the quality you will get. Apart from that I think that 70 bucks is not too much for testing the waters. Of course, that is my own opinion and yours may differ. Concerning the materials used the bow is worth the 70 dollars, though. Read the full review here => PSE Guide Heritage. The Crosman Elkhorn is made in Taiwan and sold by Crosman to the USA. It has a riser made from composite fiber which makes it a really light youth compound. Limbs and other parts are made from durable composite material. All in all this one should be able to take a lot of beating from the kiddos. Apart from the rest and the 2 composite arrows, the add-ons are okay. The rest is cheaply made, so better get a Whisker Biscuit or a similar brush-style rest for your kid, as those will hold the arrows better in place while drawing the string back. 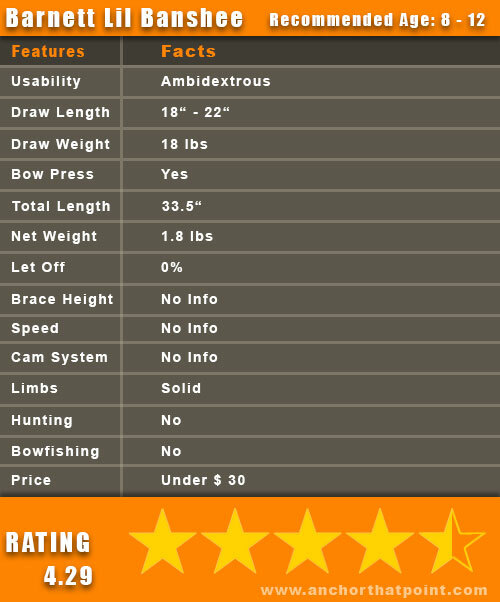 The arrows are crap too, but as the maximum draw length is 26″, I recommend the Easton Genesis 2 (1820) youth arrows again as replacement. The poundage ranges from 17 – 26 lbs – meaning that each youth compound can have a range between 17 to 26 pounds – the draw length covers ranges up to 26″. Both settings are not adjustable, which means that your kid will have outgrown it at around 13 years of age. The Crosman Elkhorn is only available for right-handed youth archers at the moment. Yes, but you have to install a nocking point or no-gloves (finger-rollers) onto the string for better consistency while shooting and therefore better accuracy. If the arrows don’t have a fixed point where your kids can nock ’em in every time, they won’t be that accurate, which will bring the motivation down quickly. The Crosman Elkhorn should be finger-shot and draws pretty smoothly. There are not many vibrations going on while shooting, which results in a better overall accuracy. With a net weight of 1 lb 12 oz even younger archers can carry it around for hours, while the generous let-off of 65% makes learning to shoot with proper form a breeze. At around 40 bucks you will get a very good option to test if your child will like shooting compounds or not – without breaking the bank completely, which is a lot better than to spend 300 dollars without knowing if the interest in archery will stay for longer. Read the full review here => Crosman Elkhorn. The Barnett Lil Banshee is well made and feels like a real compound bow. Barnett is well known for its quality models, even if they manufacture some of them overseas. The arrow rest cannot be switched out as it is molded into the riser and the 2 target arrows are crap. Get better arrows rather sooner than later, if you want to avoid seeing sad faces all the time. The poundage is set to 18 lbs, the draw length covers 18″ to 22″. Both are not adjustable. The Barnett Lil Banshee is ambidextrous, which means that it can be shot by right and left-handed youth archers, but for switching cams and string you need a bow press. Yes, definitely. Just nock an arrow in and start to shoot. As a lot of the other youth models out there, this one is meant to be finger-shot. Therefore it has finger-rollers installed that act as a nocking point. It is very smooth to draw and shoots accurately up to 20 yards – provided your kiddo has some skills. You can buy the Barnett Lil Banshee for under 30 bucks, which is a pretty low amount for testing if your kiddos might be interested in archery at all without losing an arm and a leg, if you are on a budget. And it’s totally worth it if you get them outside, away from all the techy things that demand their attention all the time. Read the full review here => Barnett Lil Banshee. The Barnett Banshee Quad seems to be a good quality youth compound. It is durable and sturdy and its limbs, cams and construction seems to be far better than a lot of the competitor models out there. Apart from that it looks and feels like a full sized adult bow, which is important for a lot of kids too. Unfortunately the rest cannot be switched out as it is molded into the riser (same as with the Barnett Lil Banshee). The 2 target arrows are also crap and I would suggest you get a bunch of better arrows fast. The Easton Genesis 2 (1820) would fit the draw length of this one. The poundage is set to 25 pounds, the draw length covers 24″ to 26″. Both settings are not adjustable! The Barnett Banshee Quad is ambidextrous too, which means righties and lefties can use it without problems. The only downer is, that you need a bow press for switching cams and string. Definitely yes. Everything is there for getting started right away. With finger-rollers installed (needs to be finger-shot) the Barnett Banshee Quad draws quite smoothly and shoots pretty accurately up to 20 yards. There is one hump before reaching the valley, after this hump it is rather easy to finish the full draw. This one is – again – a great youth compound to introduce your children to archery, as it costs only around 30 bucks, being of some quality nonetheless. So you won’t lose much if your offspring decides after some time that shooting things is not for him or her. Read the full review here => Barnett Banshee Quad. The riser and limbs of the Crosman Wildhorn seem to be made from a modern composite material like most modern compound bows nowadays. It seems to be pretty sturdy and durable, which is good, as it will have to take some beating from the little ones. These are not top notch, but surely good enough for starting out. The two fiberglass arrows that come with the Crosman Wildhorn are crap, though. Just get Easton Genesis 2 (1820), as they are proven youth arrows for target practicing. The poundage is adjustable up to 29 lbs by loosening or tightening the limb bolts. The manufacturer has not given any infos about a minimum weight setting up to this point in time. As soon as they get back to me, I will update this section. The draw length ranges from 17″ to 26″. It is adjustable without the need of a bow press. The Crosman Wildhorn is only available in a version for right handed archers at the moment. Yes. It has everything you need to get started. Just get better arrows as soon as possible. This model is pretty easy and smooth to draw and it has some power, as the arrows will easily penetrate 5 inches into a foam target at a distance of 25 yards! It is accurate and will serve your kid well for years, if you buy it when he or she is still young enough. For 60 dollars your kid will get a great bow for testing the waters, staying outside and shooting things like Hawkeye or Katniss Everdeen. He or she will definitely outgrow this one, but by that time you‘ll know for sure if he or she will stay in archery, which will make your decision to invest something better or not a lot easier. Read the full review here => Crosman Wildhorn. This contestant in this Best Compound Bow For Youth comparison is manufactured overseas, but it looks and feels quite sturdy and durable nonetheless. Considering the pink camo finish it is definitely meant to be shot by girls (there is a version for boys available too). The arrow rest that comes with this model is cheaply made and quite flimsy. As it will break soon I would suggest you get a Whisker Biscuit or other brush-style rest rather sooner than later. The 2 arrows are junk. Again I have to recommend you get some Easton Genesis 2 (1820), as these are proven models for youth archers. The poundage is set to 20 lbs, and is not adjustable. The draw length is not adjustable either and covers a range from 24″ – 26″. This means that this one will be outgrown for sure, so better get it while he or she is still young enough. The SA Sports Majestic is only available in a version for right handed shooters at the moment. Yes, but you should get a nocking point or no-gloves (finger rollers) installed to the string. These are important for getting good results while shooting, as the little archer needs a reference point like this to rely on for shooting with proper form. The SA Sports Majestic is smooth to draw and shoots as accurately as you would expect from a kid’s model. Its net weight is 3.5 pounds, which may be a bit much for younger kids, but considering the low price, this one is a good option for not breaking the bank completely. Read the full review here => SA Sports Majestic. This one is made in the USA by High Five Gear, a company based in Greencastle, Indiana. Its Backstrap Magnesium Riser seems to be well made, as are the quad limbs. Overall it is well constructed, sturdy and durable. The add-ons that come with the High Five 555 Scorcher are total junk, unfortunately. 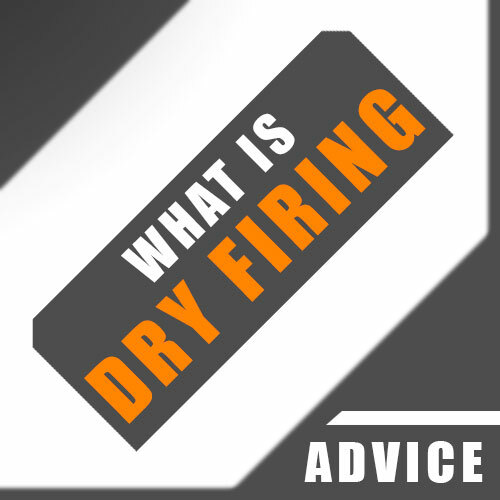 You definitely will need a better rest (Whisker Biscuit or fall-away rest), a better bowsight and a better peep sight. The 2 included arrows are crap as well, so either stick to proven youth arrows like the Easton Genesis 2 (1820) or get good carbon ones that fit the individual shooter and the youth compound. The poundage ranges from 16 to 29 lbs. It can be adjusted by turning the limb bolts that connect the limbs to the riser. Clockwise increases, counter-clockwise decreases it. Never ever back out the bolts more than three full turns! The draw length can be set from 16″ to 26″ without the need of a press. Unfortunately the High Five 555 Scorcher is only available for right handed youth archers. Not really. Too many of the add-ons are crap, so you will need to invest in better stuff to be able to shoot it well. The High Five 555 Scorcher is really easy to use, as it has finger-rollers installed to the string, which means it can be finger-shot. It draws very smoothly and shoots really accurately – provided you get better replacements for the things I have mentioned already. It has a solid back wall, a generous valley and a good let-off setting, which makes it a good option for beginners as well. At around 100 bucks you will get a great model that really will shine – if you invest in additional add-ons! Those are absolutely needed to make a great little shooter out of it and there is no way around them. If you make this additional investment you will have a really great compound, though, that easily can compete with models that cost several times as much as the High Five 555 Scorcher. 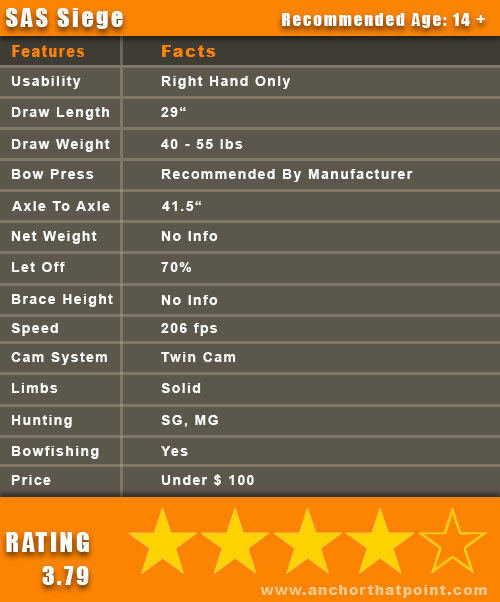 That’s why I have included it in this Best Compound Bow For Youth Beginners comparison. Read the full review here => High Five 555 Scorcher. The models in this category are meant to be shot by teens. The poundages are higher and there are more fancy goodies included. Some of these models are already good options for bowhunting, so take a closer look at the fact sheets, to learn if they are suitable for hunting or not. The Diamond Core is a very well made compound. It has an aluminum reflex riser, solid e-glass limbs and a comfortable one piece synthetic grip. Its single cam is made from aluminum as well. Overall it looks and feels very durable and sturdy. The only thing that stands out negatively here is the arrow rest, which is kinda flimsy. You need to get a Whisker Biscuit or other brush-style rest or an adequate drop-away rest to get the maximum out of this shooter. The draw weight ranges from 40 to 70 lbs and can be adjusted by loosening or tightening the limb bolts that connect limbs and riser. The Diamond Core has inspection holes, which are a cool safety feature. As long as you can the see the bolts in those, everything is okay. The draw length ranges from 25″ to 30″ and a press is not needed for adjustment. The Diamond Core is available in a version for right and left-handed archers. Yes. Only the peep sight needs to be adjusted if necessary, a D-loop is already installed onto the string, but you should ckeck its position as well, before shooting it. The Diamond Core is very smooth and really very quiet to draw, which is good for bowhunting. Thanks to the noise eliminating string stop its release is quiet as well. Apart from those benefits it is well balanced and shoots very accurately. The back wall is solid, the valley wide enough and the let-off of 80% is generous enough, so that beginners will also enjoy shooting it. For around 370 dollars you will get a quietly and accurately shooting full sized model where you only have to invest in a better arrow rest. 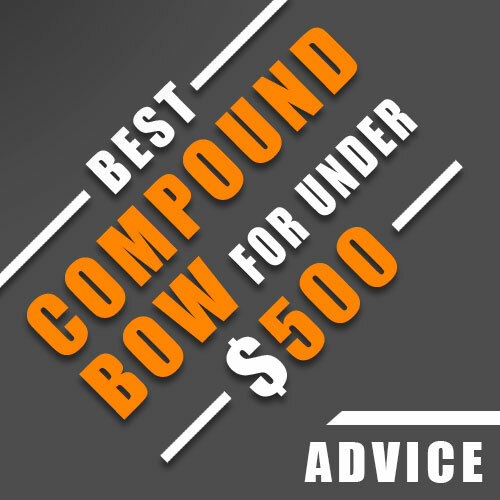 It is a great option for beginners and seasoned bowhunters that want a high quality compound. Be aware that the Diamond Core is a model from 2013 (that’s why it is not that expensive anymore! ), though! It is proven and tested and will serve you well for years to come! Read the full review here => Diamond Core. The AW Pro is manufactured in China by Junxing Archery. The importing company, AW, is based in California. It has an aluminum riser and durable limbs made from a modern composite material. Apart from that, it looks well constructed, sturdy and durable. You could get a better rest and sight later, but for starting out it has everything you need included, which is a really big plus, in my opinion. The poundage can be set from 20 to 70 lbs, which is quite a bit. It can be adjusted up or down by loosening or tightening the bolts that connect the limbs to the riser (limb bolts). The draw length can be set from 17 to 29 inches without the need of a press. This wide adjustability makes the AW Pro a great option specifically for teens, as it can grow along with them for years. 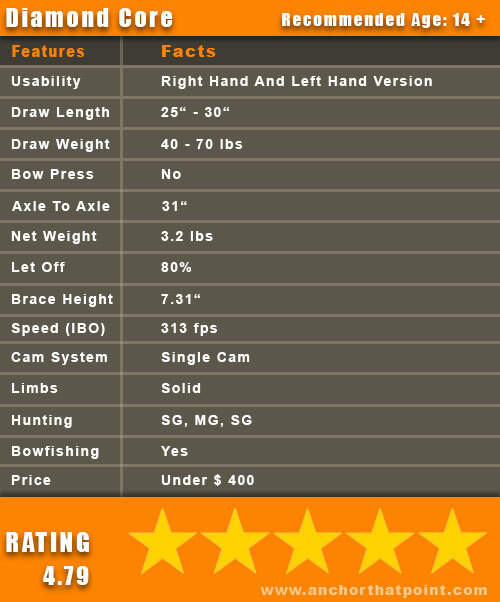 The AW Pro is available only for right-handed archers at the moment, which is a pity, in my opinion. Definitely. You eventually need to have the peep and the D-loop re-adjusted, if those won’t meet your needs, which is pretty normal. The AW Pro draws very smoothly and shoots accurately up to 30 yards without any problems. Tight groupings can easily be achieved at that distance. The back wall is solid, the valley big enough and the let-off (80%) good for beginners and seasoned archers. At around 270 dollars you will get a great quality compound for youth that has everything included to get started right away, which makes it a great option for beginners and especially teens, because due to its wide adjustability, the AW Pro can grow along with them for years. This makes it a great entry in this Best Compound Bow For Youth Beginners comparison. Read the full review here => AW Pro. The Barnett Vortex Youth is manufactured to Archery Trade Association (ATA) and Archery Manufacturers’ Organization (AMO) standards. This means it is made of high quality components and is constructed pretty well. The riser and limbs are made of sturdy and durable composite. The 3 arrows that come with this one and the arrow rest are crap. As long as the draw length of your kid is around 26“ to 27“ you could stay with Easton Genesis 2 (1820) youth arrows, otherwise you need to get some that fit the youth compound and your kiddo. For a better rest just look at a brush-style type like a Whisker Biscuit or a fall-away rest. The poundage of the Barnett Vortex Youth ranges from 16 to 45 pounds and is easily adjustable with an Allen wrench by tightening or loosening the limb bolts that connect the limbs to the riser. Never back out the bolts more than three full turns! The draw length can be set from 21″ to 27″. A press is needed for certain ranges as the draw weight depends on the draw length, though. If you stay between 19-41 pounds and 22″-26″, you don’t need a press for adjusting. If you go for 16 or 45 lbs and 21″ or 27″, you definitely will need a press. The Barnett Vortex Youth is only available in a version for right handed shooters, at the moment. Yes. But a better rest is needed without a doubt, before achieving good results with it. The Barnett Vortex Youth can be finger-shot (install a nocking point for doing it this way) or you can use a release aid for shooting it, after you have installed a D-loop onto the string. You also could serve a peep sight in, if you want to. The draw cycle is smooth, the back wall solid and the valley wide enough for beginners. For around 120 bucks you will get a model from a well known brand that won’t cost you an arm and a leg for testing the waters. It is well built and seems to be very durable and due to its adjustability it could grow along with your son or daughter for some years, if they get it when they are still young enough. Read the full review here => Barnett Vortex Youth. The Barnett Vortex Hunter is manufactured to Archery Trade Association (ATA) and Archery Manufacturers’ Organization (AMO) standards, which means construction and quality standards are pretty high. It has a well machined aluminum riser and durable split limbs made from composite. The rest that comes with this model is crap, so I suggest you‘d better get a Whisker Biscuit or drop-away rest to raise your accuracy quite a bit. You can set the poundage from 45 to 60 lbs and adjust it by loosening or tightening the limb bolts that connect the limbs to the riser. The maximum number of full turns is 3 – never ever do more than 3 full turns or the compound might fall apart rather violently! The draw length range is from 26″ to 30″ and you don’t need a press for adjusting it. 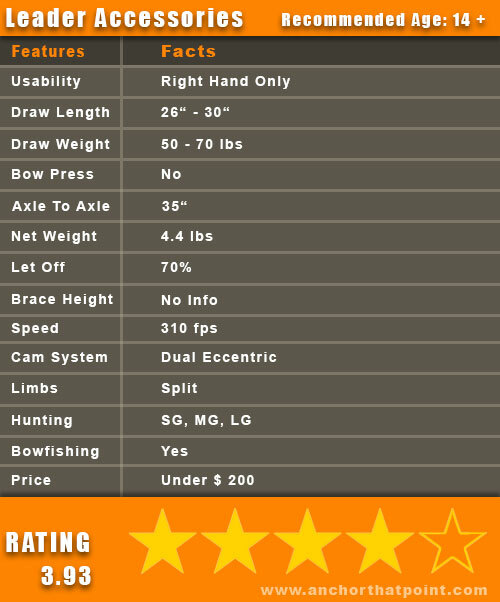 The Barnett Vortex Hunter is only available for right handed youth archers at the moment. Theoretically yes, but you need to get a peep sight and a D-loop and a mechanical release aid for being able to use it properly – and a bunch of arrows that need to fit the compound’s draw length and poundage setting and the individual shooter’s draw length. Although it has a very aggressive binary cam system the Barnett Vortex Hunter is smooth to draw and shoots extremely accurately. 3 inch groups at 40 yards are no problem at all – provided you get better add-ons and you’ve got some skills. At distances greater than 60 yards you will experience some minor problems concerning accuracy, though. Up to 60 yards it is absolutely great to shoot. At around 180 bucks you will get a very well designed and manufactured model that can easily compete with models that cost twice as much and I know that a lot of adults are using it too, which means it is a very good option to go bowhunting without losing an arm and a leg. Due to its wide adjustability it can grow along with a teen for years. 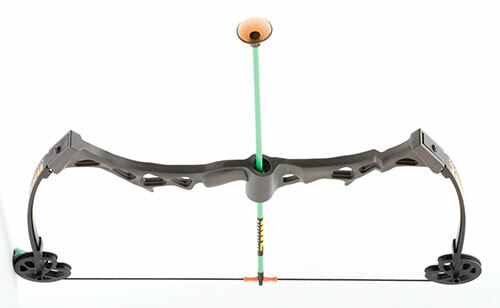 Read the full review here => Barnett Vortex Hunter. The SAS Rage is made by Man Kung in Taiwan and is sold by SAS to the US market. It has an aluminum riser and limbs made from durable composite. The craftmanship seems to be pretty high and the overall impression of this one is quite good. The add-ons that come with this model are okay for starting out. You may want to upgrade the rest and sight further down the line, but this is not needed for getting started. The poundage range is from 55 to 70 lbs. It can be adjusted by loosening or tightening the bolts that connect the limbs to the riser. The maximum number of full turns is 4. Don’t you ever back ’em out more than 4 full turns or it might fall apart pretty violently, due to the tension. As the minimum poundage is rather high for a tween or teen, youth archers should have some strength to be able to use this one. that’s why I deducted a point. The draw length can be set from 26″ to 30″. Adjustment can be done without the use of a press in this case. 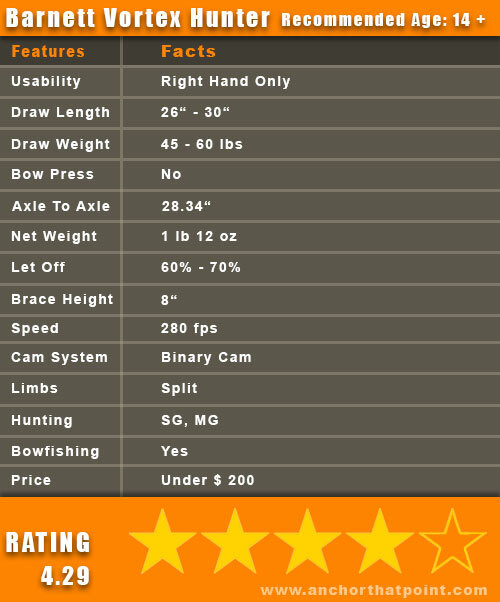 The SAS Rage is only available in a version for right handed archers, which is a pity, as it really is a fine compound. The SAS Rage is somewhat harsh to draw when you are not used to it. The back wall is solid, the valley wide enough and the let-off quite good for new archers. Provided you get better add-ons and know what to do, the SAS Rage is a surprisingly accurate shooter. For around 170 dollars this one is a great option for strong teens to test the waters with a compound that can easily keep up with models that cost twice as much. Due to its adjustability it can grow along with a teen for years, provided it gets treated properly. Read the full review here => SAS Rage. The iGlow Compound is manufactured in Taiwan by Man Kung. It is a high quality model that seems to be sturdy and durable and will last for years if treated properly. It is made from a modern composite material like all the other modern models out there. As it happens so often with these affordable models, the arrow rest, bowsight and arrows that come with the iGlow Compound are crap. You just need to get a Whisker Biscuit or fall-away rest, a decent bowsight and good arrows to make it shine. Otherwise you won’t be as good with it as you could be. The poundage can be set between 30 and 70 pounds, adjustable via an Allen wrench by loosening or tightening the limb bolts that connect limbs and riser. Clockwise increases, counter-clockwise decreases the weight. The draw length range is from 25″ to 31″ and you definitely don’t need a press for adjusting it up or down. The iGlow Compound is only available for right handed shooters. Yes. All you need to get additionally is a D-loop installed and a peep sight served in to make a great shooter out of it. You also could get a nocking point installed, in case you want to finger-shoot it. The iGlow Compound is rather smooth to draw thanks to its dual cam system. There are no humps before reaching the valley, the back wall is solid and the let-off is quite good for new archers that need to concentrate on proper form, rather than holding back a lot of weight. For around 200 bucks the iGlow Compound is a great entry-level model that could grow along with a youth archer for years when treated properly. Just keep in mind that you have to invest in better add-ons and some additional goodies to make a great shooter out of it. 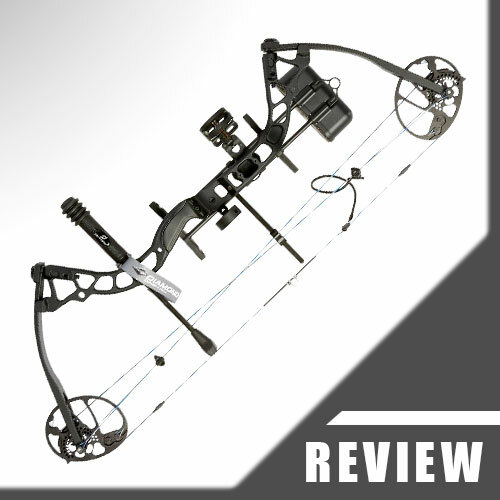 Read the full review here => iGlow Compound Bow. This one is made by Man Kung in Taiwan and is sold by Leader Accessories to the US market. It has an aluminum riser and durable composite limbs. The bare compound seems to be of a higher quality than you might expect. The add-ons that come with this model are crap. You definitely need to get a better arrow rest (Whisker Biscuit or drop-away) and sight to get the most out of it. The poundage can be set from 50 to 70 lbs. By loosening or tightening the limb bolts that connect the limbs to the riser, you can adjust it up or down. The maximum number of full turns is 4, which means you never ever should back ’em out more than 4 full turns, or it might literally explode in front of your eyes. 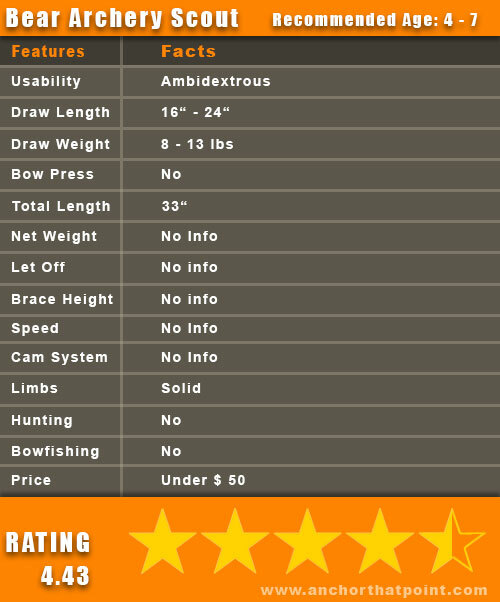 50 pounds is quite a bit for a 14 year old, that’s why I deducted 1.5 points here, because that means it is only usable for youth archers that are on the stronger side musclewise. The draw length ranges from 26″ to 30″. You can adjust it by loosening the screws in the cams, rotating the modules and re-tightening them. There is no bow press needed for adjusting. 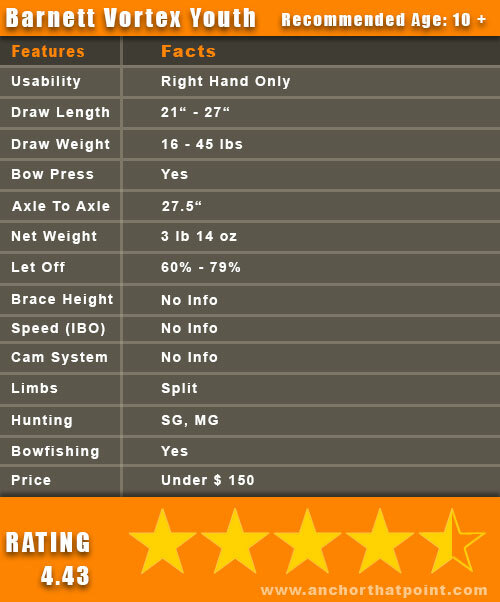 The Leader Accessories Hunting 50-70 is only available for right handed youth archers at the moment. Yes, but you will need better add-ons to make it great. This one draws very smoothly and shoots very accurately – provided you‘ve got some better add-ons. Also get rid of the movable nocking points and get a real one or a D-loop installed. It has a solid back wall and a wide enough valley, which is good for beginners. Priced at around 150 dollars, the Leader Accessories Hunting 50-70 can easily keep up with models that cost three times as much (full sized adult ones). But keep in mind that you need to invest in some accessories before being able to use its full potential. Read the full review here => Leader Accessories 50-70 Hunting. The SAS Siege is manufactured by Man Kung, a Taiwanese company, and is sold to the USA by Southland Archery Supply. It has an aluminum riser and ABS compressed solid limbs. Overall it looks well made, sturdy and durable. There is not much coming with the SAS Siege, but the arrow rest and bowsight are junk, so you need to get a Whisker Biscuit type of rest or a drop-away rest as replacement, otherwise you won’t be able to get good results with this model. The poundage of the SAS Siege ranges from 40-55 lbs and can be adjusted via the limb bolts (clockwise increases, counter-clockwise decreases the weight). Never ever back them out more than 3 full turns or this one might fall apart rather violently, as compounds are under a lot of tension all the time. The draw length is set to 29″, and is non adjustable. The SAS Siege is only available for right handed shooters. Not really, as you need to get a D-loop (for shooting with a release aid) or a nocking point (for finger shooting) installed before you are able to use it correctly. The SAS Siege can be finger-shot, as it is designed more like a recurve anyway. After getting better add-ons and sighting it in, it shoots very accurately. The draw cycle is smooth, the back wall solid and the valley wide enough. This one costs around 100 bucks. It is a very good full sized entry level model for beginners or even seasoned bowhunters and can easily compete with models that cost three to four times as much. Just remember that you have to invest in better add-ons, or you won’t be able to bring it to its full potential. That’s why I have deducted 1.5 points here. Read the full review here => SAS Siege. The SAS Solid Limb is called ‘The Predator’ but was advertised by Southland Archery Supply under ‘SAS Solid Limb’ for some time, that’s why I will stick to this name for now. It is manufactured overseas and sold by SAS to the USA. The bare compound seems to be sturdy and well made, has solid ABS compressed limbs, CNC machined cams and a durable looking riser. The arrow rest that comes with this one is crap again, so you need to invest in something better to get the best out of this model. Get a brush-style rest like a Whisker Biscuit or a good drop-away rest. You also will need some string dampeners and a stabilizer to get rid of the vibrations while shooting. The poundage can be set from 35 to 65 lbs by adjusting the limb bolts that connect the limbs to the riser. Clockwise tightens and raises the weight, counter-clockwise loosens and decreases it. Never ever loosen more than 4 full turns! The draw length can be set from 22″ to 31″ but you need a press for doing so. 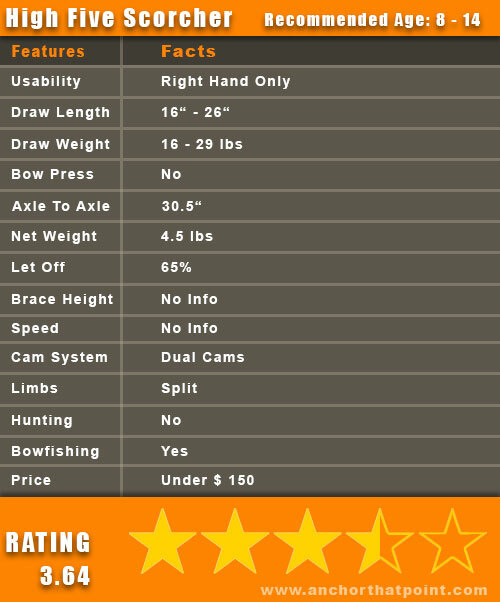 This one is only available for right handed youth archers, which is the case for a lot of the more affordable models available at the moment – unfortunately. Yes, but you need to install a D-loop or nocking point or finger rollers (no-gloves) onto the string before being able to shoot accurately with it. This one draws pretty smoothly – especially when you have a stabilizer and string dampeners in place. It has a solid wall with a little creep, though, and shoots – provided you get better add-ons – really accurately. 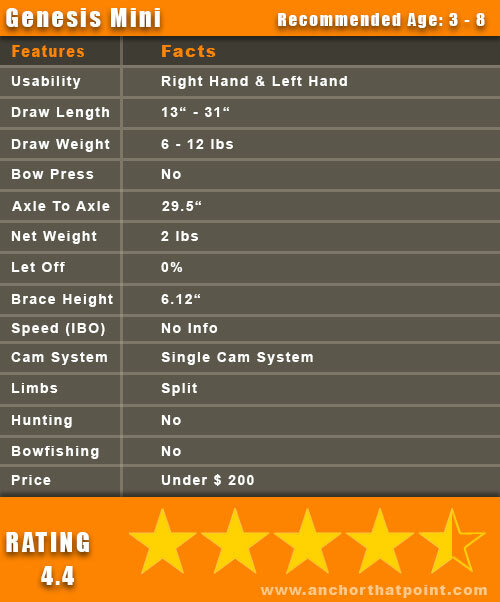 The SAS Solid Limb costs around 150 dollars, which makes it a very affordable option for new archers that don’t want to break their bank completely for their new sport. As it is solidly built and has some decent quality it is a good idea to invest in something like this before spending three times as much just to find out that archery or bowhunting is not for you. But keep in mind that you will have to invest in better add-ons to get the best out of it. Read the full review here => SAS Solid Limb. The SAS Rex Quad Limb is manufactured overseas and is sold by SAS to the US Market. It is made from a modern composite material and has ABS compressed durable limbs. The compound itself seems to be quite sturdy and well made. The arrow rest, the bowsight and the 3 arrows that come with the SAS Rex Quad Limb are crap, which means that you have to invest in better add-ons like a brush-style (Whisker Biscuit) or a fall-away rest. You also need good carbon arrows that fit the compound and the shooter. The draw weight can be set from 25 to 55 pounds by turning the limb bolts (the ones that connect the limbs to the riser) clockwise (increase) or counter-clockwise (decrease) with an Allen wrench. The draw length can be adjusted from 20″ to 29″, but you will need a press for doing it, which is not that great. 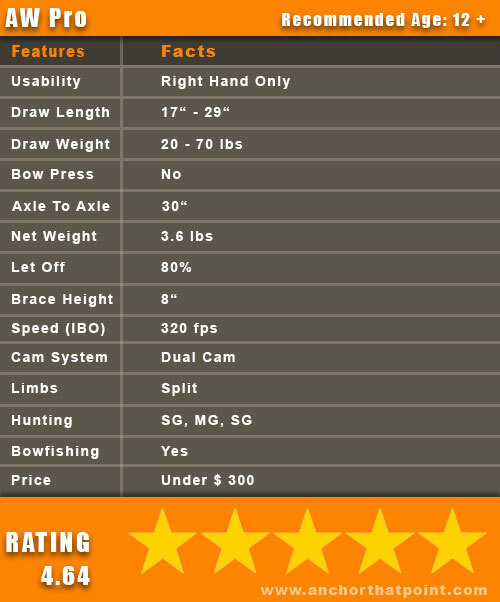 The SAS Rex Quad Limb is only available in a version for righties, so left-handed youth archers need to get something else. Almost. You need to install a D-loop or nocking point, depending on if you want to shoot with a release aid or your fingers and the peep sight needs to be adjusted. The SAS Rex Quad Limb felt relatively smooth to draw thanks to its twin cam system that works like a charm. The back wall is solid and the valley wide enough. The let-off of 65% is quite good for beginning youth archers that need to concentrate on proper form. Overall it shoots quite accurately, provided the archer has got some skills. At around 200 bucks the SAS Rex Quad Limb is a good and still affordable entry-level model, which can grow along with a youth archer for some years, due to its adjustability. The SAS Rex itself is well made from high quality materials. You only have to invest in better add-ons and things like D-loop and peep sight to make a very good little shooter out of it. Read the full review here => SAS Rex Quad Limb. The SAS Sergeant is manufactured by Poe Lang in Taiwan and is sold by Southland Archery Supply to the US market. The riser is manufactured out of a modern composite material, the limbs are made from an ABS compressed piece-layered material. Overall it looks well built, sturdy and durable. Crap all the way, unfortunately, which means you have to invest in a better rest, bowsight and other stuff. The draw weight ranges from 40 to 55 pounds, which can be adjusted by loosening or tightening the limb bolts that connect limbs and riser. You simply need an Allen wrench for adjusting it up or down. The draw length ranges from 27″ to 29″, which is not that much, to be honest. Unfortunately, you will need a press for adjusting in this case. The SAS Sergeant is available only for right handed shooters at the moment. After you get all the better add-ons, yes. The whole draw cycle is pretty even without showing any humps before reaching the valley. The solid wall has a little bit of a creep behind it, the valley is wide enough and the let-off with 65% is generous enough for beginners. Apart from that it can be finger-shot, if you want to. For around 150 bucks you will get a very well made bare model that is a good option for beginners and archers that don’t want to spend an arm and a leg for their new hobby. But be aware that you will have to invest another sum (if not the same) in better add-ons to get the most out of this model. Read the full review here => SAS Sergeant. The following models are higher priced and have a lot of extras included, which make ’em truly ready-to-shoot-out-of-the-box compounds. These ones are for the serious little archers that want to join their daddies bowhunting rather sooner than later. Bear Archery’s Cruzer is made from premium lightweight aluminum and clearly shows the quality in every single component that Bear Archery has made for decades. It has an aluminum reflex riser and durable composite quad limbs. It is very well built, sturdy and durable. The Bear Archery Cruzer RTH (Ready To Hunt) includes only high quality add-ons and you don’t have to upgrade a single thing to get started. Just pick it up and start shooting. The draw weight ranges from 5 to 75 lbs and can be adjusted via an Allen wrench by loosening or tightening the limb bolts that connect the limbs to the riser. The maximum number of full turns is 12! Don’t do more or this one might fall apart violently, due to the tension that is there all the time. 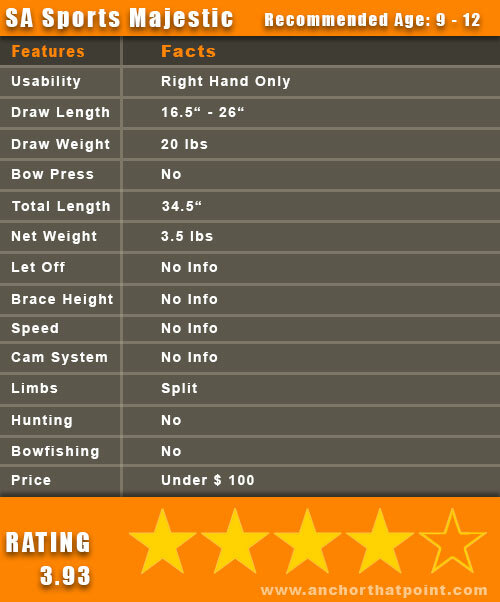 The Bear Archery Cruzer is available in a version for right and left-handed archers. Definitely. You only have to tie the peep sight in after positioning it on the string for your needs. Apart from that you need to check the position of the D-loop and get a mechanical release aid. 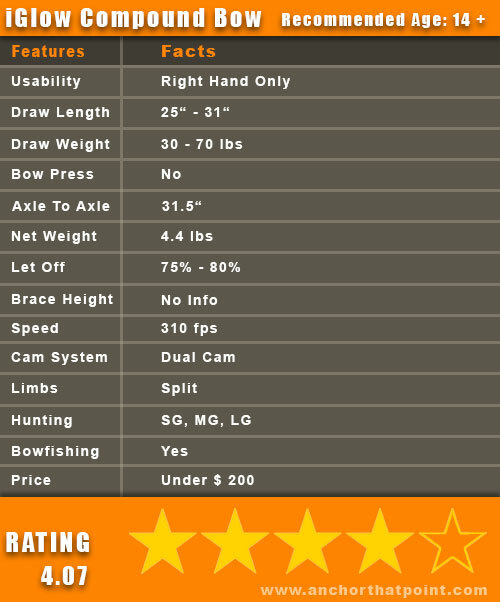 Thanks to the MV dual cam system the Bear Archery Cruzer is very smooth to draw and shoots absolutely accurately. The system works like a charm without any flaws. The back wall is solid, the valley wide enough and the let-off is generous enough for new archers that need to focus on shooting with proper form. 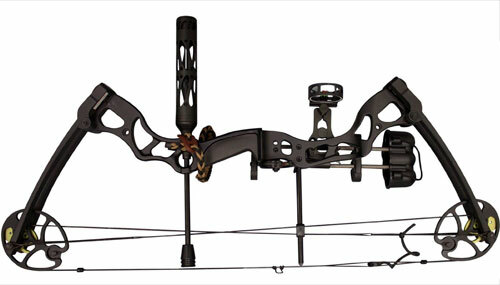 The Bear Archery Cruzer costs around 390 dollars – but it is worth every single penny. There is absolutely nothing you need to switch out to get started, everything works like it should. The extremely wide adjustability covers all draw weights and all draw length ranges that are imaginable. That’s why this one can be your hunting buddy for years. 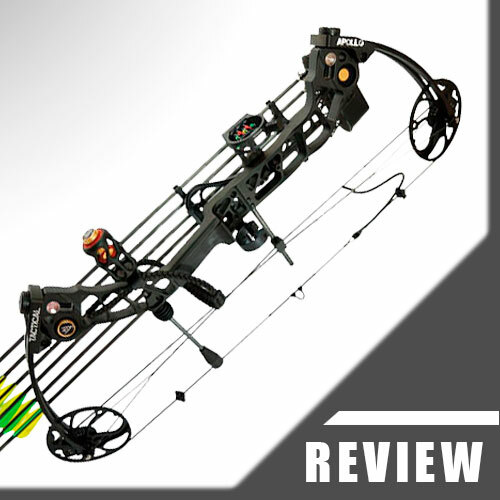 Read the full review here => Bear Archery Cruzer. The Diamond Infinite Edge Pro is made in the USA. Only high quality materials are used for the aluminum riser, limbs, cams and other parts of this model. This model is one of the best selling compounds at the moment! This one comes with high quality add-ons, which means you don’t have to switch anything out for getting started. You may want to upgrade the arrow rest further down the line, but it is definitely not necessary to get started. The poundage range is from 5 to 70 lbs. You can adjust it via an Allen wrench by loosening or tightening the bolts that connect the limbs to the riser. The draw length can be set from 13″ to 31″ without a press. The Diamond Infinite Edge Pro is available in a version for right-handed and left-handed archers. The Diamond Infinite Edge Pro is absolutely smooth to draw, the cams are not aggressive at all and it shoots really fast and accurately. There are no humps before reaching the valley, the back wall is solid and the valley rather wide. The Infinity Setting zeroes the let-off, so that everyone can use it without adjusting the draw length all the time (like a recurve). For around 350 dollars you will get a great package with everything included for starting out. Bowtech stands for a certain quality and you will get a lot of it with this model and its accessories. Due to its wide adjustability this one really can be shot by nearly every one, be it kid, tween, teen or adult. The Diamond Infinite Edge Pro literally can grow along with your kid for years. Read the full review here => Diamond Infinite Edge Pro. The Apollo Tactical is hand assembled and test fired in the USA by a family run company. That’s why it proves great craftmanship. The whole compound is made from CNC milled billet aluminum (Riser, body, cams, …), which gives it great sturdiness. Only high quality add-ons made it into this package. This one is a feast for every bowhunter. You get everything you need and much more; there’s really nothing missing. The draw weight ranges from 25 to 70 pounds, adjustable by loosening or tightening the bolts that connect the limbs to the riser. The draw length range is from 19″ to 30″ and it can be adjusted without a press. 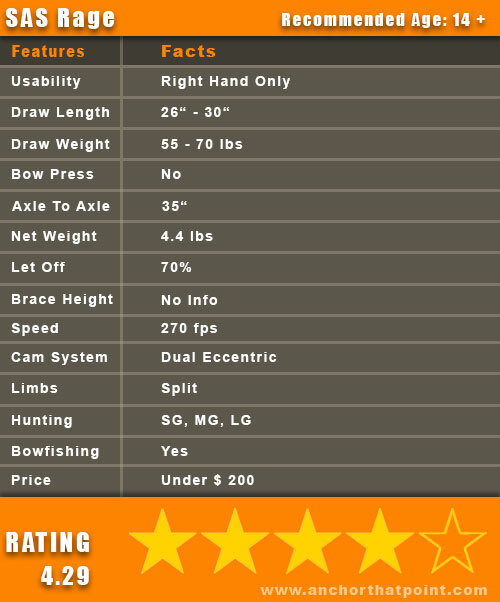 The Apollo Tactical is available in a version for right-handed and left-handed archers. Without a single doubt. You only get high quality add-ons with this model and you will get everything you need for getting started. This one is truly ready to shoot out of the box. The Apollo Tactical is – thanks to its flawless dual cam system – very smooth to draw. Its back wall is solid and the valley is just wide enough. When everything is adjusted to fit the individual shooter, this one shoots absolutely accurate – provided you‘ve got some skills. The Apollo Tactical and all the goodies that come with it cost around 750 dollars, but the value that you get with this great package exceeds this price by far. The wide adjustability makes it a great choice for tweens, teens, adults, beginners and seasoned bowhunters. It will grow along with a teen for years – literally. Read the full review here => Apollo Tactical. You made it! Thanks for reading this rather long post. I really hope that it helped you to get a good overview of all the interesting models that are available at the moment and hopefully you were able to make a decision concerning a certain model for your kid. If you are buying for yourself, I would encourge you to dig through all the other in-depth reviews on Anchor That Point. Maybe there is something interesting to find for you too.